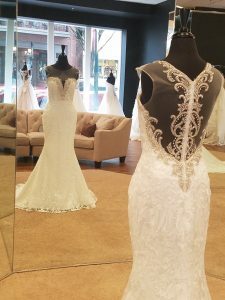 A Variety of designer wedding dresses located in New Bern, NC. 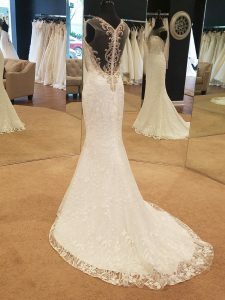 We have decided that each week it would be fun and maybe a little adventurous to pick a dress (any dress!) at random and have an “off the rack” Deal of the Week! Sounds pretty awesome, am I right?! So off the rack means if this is YOUR dress that you take it with you right out of the store. That is a WIN WIN situation, especially if your wedding is in the Summer months. Our dress this week is Cristiano Lucci “MOLLY” (Style 13099). 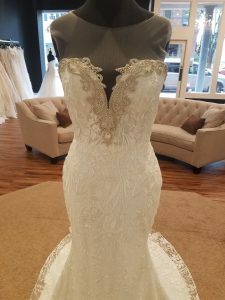 If you want to try this beauty on at our boutique in historic New Bern, NC please contact the store for more information!